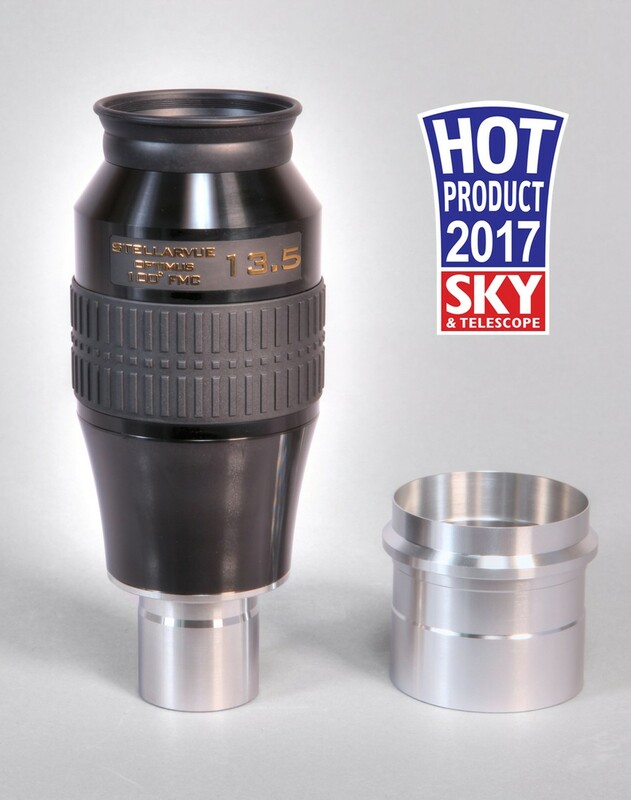 Introducing the new Stellarvue Optimus 13.5 mm eyepiece ideal for use with large reflectors and as a wider field variant for refractors. This is a wonderful deep sky medium power eyepiece with a razor sharp field when used with a field corrector. A 100 degree field of view provides the user with almost 1.5 times the area of an 82 degree eyepiece. When using hand driven alt-azimuth mounts this generous field will be appreciated. The eyepiece offers a generous 15 mm of eye relief and has a standard foldable rubber eye cup. Each of the eight elements are fully multi-coated, edge blackened and the lens barrel and baffles are similarly dark black. All of these factors add up to create an extremely contrasty eyepiece that is free of unwanted reflections, flaring or ghosting. We recommend this as the ideal deep sky eyepiece for viewing nebulae, clusters and galaxies.